Hello everybody! How are you doing? I'm still stuck in bed most of the time, but my knee is getting better. I'm having sutures taken out on Monday and hopefully everything will be fine and I'll be up and running around again in no time. Instead I used the cute boy ona star image which I printed out quite some time ago and it is a freebies at Angelique's blog. I colored the image with Promarkers and on the back I did some shading with Faber Castell pencils. On the wings I put some glitters. The papers are from Heidi Grace designs and from Provo Craft. The ribbons and buttons are from my stash. 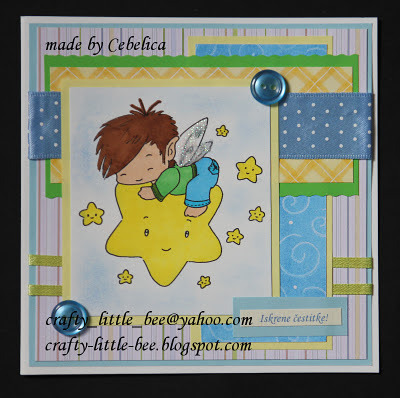 Gorgeous card Cebelica, love the sweet image and very lovely colours. Awww such a cute image! The layout and colours are gorgeous. Awwww this is so cute! I love your papers and layout. what a cutie of a card !